Maintaining healthy gums goes hand-in-hand with keeping your teeth healthy. Red, swollen gums can be a sign of serious oral health problems. Read on to learn more about the types of periodontal (gum) disease and treatments we offer to keep your gums healthy. Gingivitis This is the first stage of periodontal disease, and it causes the gums to become red, swollen and bleed easily when brushing and flossing. The primary cause of gingivitis is poor oral hygiene. The good news is that it can be reversed with professional teeth cleaning and improved home care. 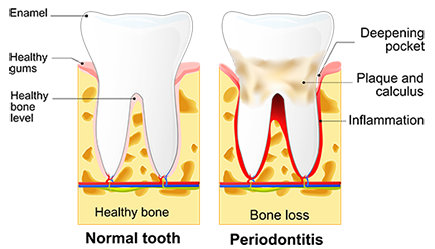 Periodontitis If left untreated, gingivitis will progress and become periodontitis. This is caused by plaque formation that spreads and grows beneath the gum line, which irritates the gums and creates an inflammatory response. Over time, the gum tissue and bone begin to recede and break down. Teeth can become lose, begin to shift and eventually may fall out if left untreated. Periodontal disease cannot be cured, but it can be maintained. Those who have periodontal disease may benefit from professional teeth cleanings three or four times per year to help keep plaque from accumulating beneath the gum line. Scaling and root planing is one of the least invasive treatments for gum disease. It involves the careful cleaning of tooth root surfaces to eliminate tartar and plaque accumulation beneath the gums. Then the roots are smoothed to remove harmful toxins. Patients who have advanced cases may benefit from a referral to a periodontist. Dr. Ted Kimball will provide an assessment and a referral if necessary. In its earliest stages, many patients don’t realize they have gum disease because symptoms typically don’t appear until the disease has advanced. That is why keeping up with routine dental appointments is important. Our trained professionals use diagnostic tools to identify gum disease early and improve your chances of getting the disease under control. Systemic diseases including diabetes, heart disease and rheumatoid arthritis- Conditions that interfere with the body’s inflammatory system may affect gum health. Many studies have identified connections between systemic diseases and oral health. Smoking and use of other tobacco products- Studies have shown that tobacco use may be one of the most significant risk factors in the development and progression of periodontal disease, according to the American Academy of Periodontology. Poor nutrition- It is more difficult for your body to fight infection when it lacks proper nutrition. Genetics- Some people are more prone to gum disease, regardless of their oral care, diet and overall good health. Stress- Stress can make it tougher for your body to combat infection. Pregnancy- It is recommended that pregnant women have a periodontal evaluation. Gum disease has been linked to premature births and low birthweight in babies. Substance abuse- Besides being illegal, drugs such as opioids, heroin and cocaine can lead to gum disease. Aging- Older people have the highest rates of gum disease. Medications- Oral contraceptives, anti-depressants and some heart medicines can affect oral health. Tell us about all the medicine you take so we can monitor your oral health accordingly.